Report from the national Drug Enforcement Administration provides a yearly assessment of the many challenges local communities face related to drug abuse and drug trafficking. Highlights in the report include usage and trafficking trends for drugs such as prescription drugs, heroin, methamphetamine, cocaine, marijuana, and the hundreds of synthetic drugs. Read the full 2018 report here and a summary of key findings here. The toolkit of digital resources to help promote the Drug Enforcement Administration’s upcoming National Prescription Drug Take Back Day is now live. The “Partnership Toolbox” includes a variety of materials – posters, pamphlets, ads, billboards, and social media art that is pre-sized for Twitter, Facebook, and Instagram. 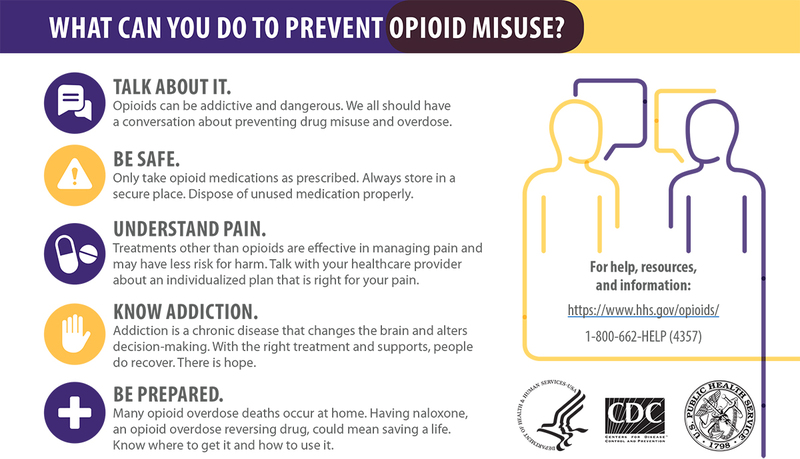 The Substance Abuse and Mental Health Services Administration (SAMHSA) announces the release of the Spanish translation of the updated Opioid Overdose Prevention Toolkit. This toolkit offers strategies to health care providers, communities, and local governments for developing practices and policies to help prevent opioid-related overdoses and deaths.